Yin made the discovery during his analysis of satellite images from THEMIS (Thermal Emission Imaging System), an instrument on board the Mars Odyssey spacecraft, and from the HIRISE (High Resolution Imaging Science Experiment) camera on NASA's Mars Reconnaissance Orbiter. 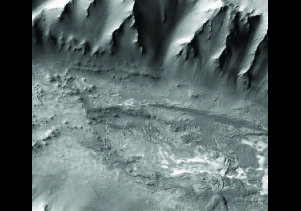 He analyzed about 100 satellite images — approximately a dozen were revealing of plate tectonics. 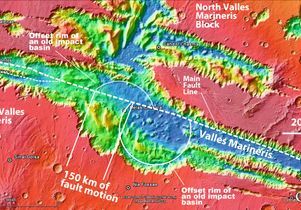 The surface of Mars contains the longest and deepest system of canyons in our solar system, known as Valles Marineris (Latin for Mariner Valleys and named for the Mariner 9 Mars orbiter of 1971–72, which discovered it). It is nearly 2,500 miles long — about nine times longer than the Earth's Grand Canyon. Scientists have wondered for four decades how it formed. Was it a big crack in Mars' shell that opened up?